Rawlins Paints stock an extensive range of wood finishes for interior timber. These include clear and coloured products, providing excellent protection and enhancing the appearance of wooden surfaces. 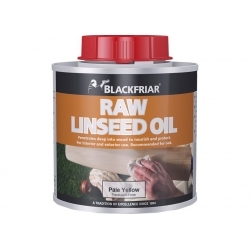 So, if you require the leading Danish oil, teak oil, furniture paint, floor oil, wood stain, wood varnish, gloss and eggshell paints for interior wood and timber décor and furnishing, you can find them in this category. Whether you're painting floors, furniture, windows, trim, interior cladding or ceilings, we have a solution to fit your requirements, from leading manufacturers of interior wood finishes – Ardenbrite, Bedec, Blackfriar, Coo-Var, Mathys, Solignum, Rust-Oleum, Teamac, Thermilate and Timberex. These interior stains and varnishes have been used extensively in schools, colleges and universities for wall cladding, communal furniture and more. 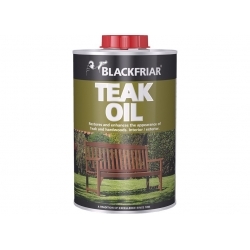 Transform your interior wooden surfaces with Blackfriar Quick Drying Varnish. Ideal for all interior wood including doors and panelling, it provides a quick drying finish that is tough and durable. 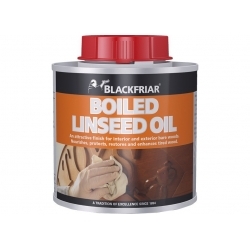 Blackfriar Quick Drying Varnish resists knocks, hot water splashes and some household stains. 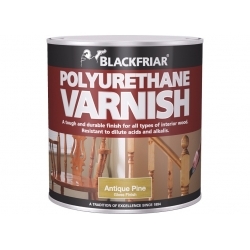 Transform interior woodwork with Blackfriar Polyurethane Varnish. This tough and durable varnish brings out the natural grain and colours of wooden surfaces – and protects them from household stains including hot water. For all types of interior wood, tough and durable, resists hot water splashes and dilute acids, solvent based. 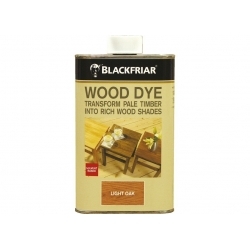 Blackfriar French Polish provides the classic fine finish for wood. It&rsquo;s suitable for new, stained, or previously French Polished wood and brings out the natural beauty of wooden surfaces. A range of water-based grey stains that penetrate deep into the wood for a lasting grey &lsquo;weathered wood&rsquo; look.&nbsp;Only need to apply once, then a topcoat can be applied. Ardenbrite have manufactured some extremely decorative interior wood finishes, including the popular gloss Protective Glaze, for internal (and external use) over their Metallic Wood Paint range. For ornate and decorative rejuvenation of furnishings, try Bedec Crackle Glaze to add a distressed finish to units, tables, shelves and more. It’s best described as a snakeskin or crocodile skin effect! If you require a brilliant white wood paint in polyurethane gloss or satin enamel, try Bedec Aqua Advanced. These high-quality and quick-drying paints will not yellow, and are ideal for a range of other surfaces and materials away from just wood – for improved colour conformity. For more information about wood oils, read this article on our blog. 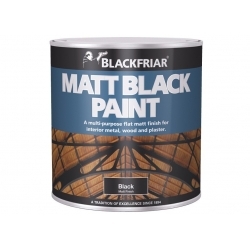 Blackfriar also manufacture two popular wood varnishes – a quick drying one for interior wood surfaces, and a polyurethane one for staircases, bannisters and structural features.